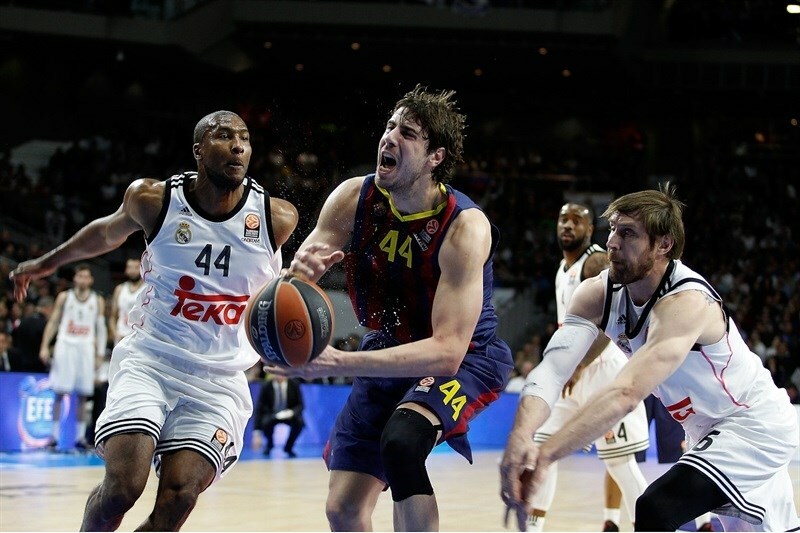 Real Madrid made a major response to its first Top 16 defeat by hammering arch-rival FC Barcelona 97-73 on Thursday in the Game of the Week at BarclayCard Center, this spring's Final Four venue in the Spanish capital. It was the second-biggest win in 21 games between these teams in the Euroleague dating to 1994, surpassed only by Madrid's record 100-62 win at last season's Final Four, which set the semifinals record for score difference. 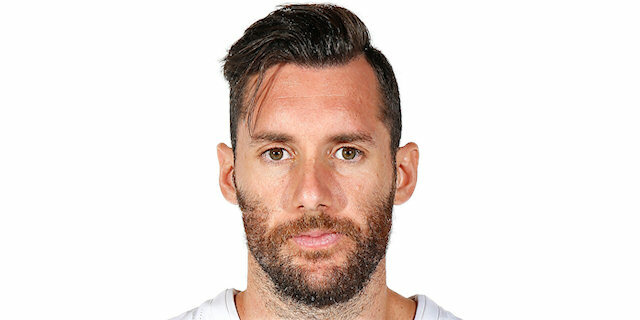 This time, Rudy Fernandez sparked Madrid's early get-away by hitting 3 three-pointers in 3 minutes, more than Barcelona would for the entire first half. Then Sergio Rodriguez managed the second half in similar fashion to put the outcome out of doubt early and keep Madrid tied for first place in Group E with a 5-1 record. 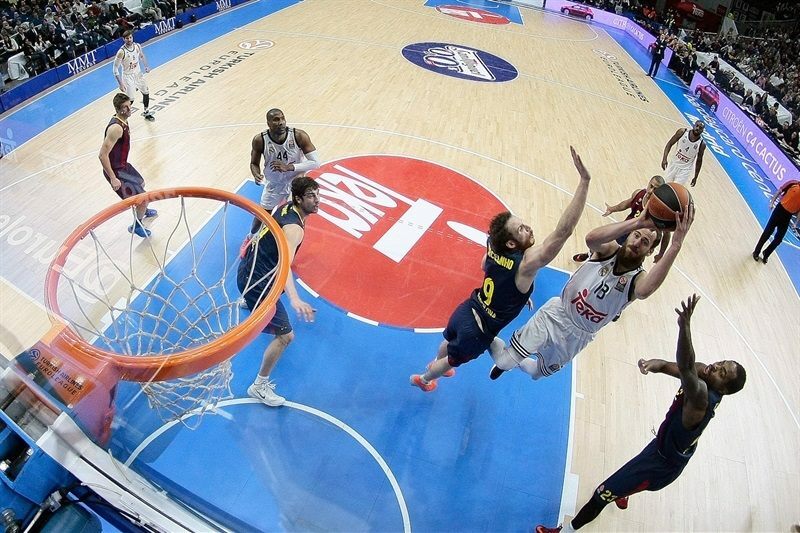 Barcelona, which led for just one possession at 5-7 and played without injured leader Juan Carlos Navarro, fell to 3-3. 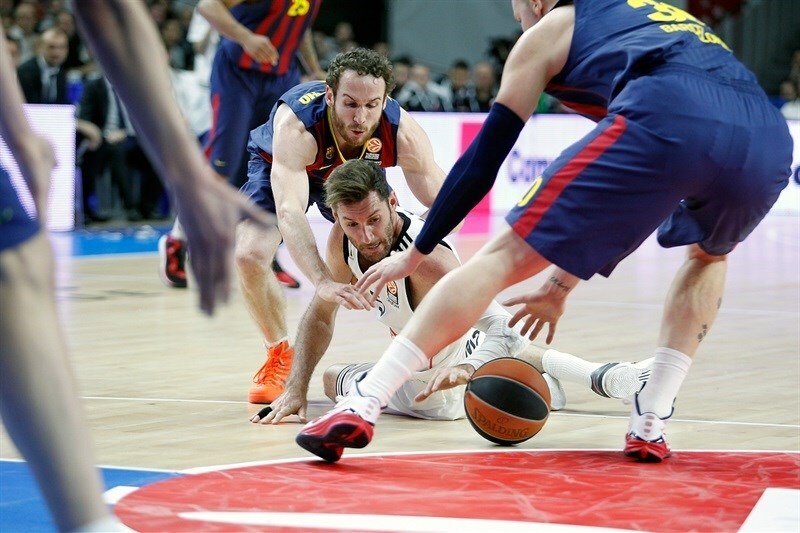 Rodriguez was Madrid's top scorer with 23 points, to which he added 6 assists and 3 steals. Fernandez had 22 points, 9 rebounds, 5 assists and 3 steals. 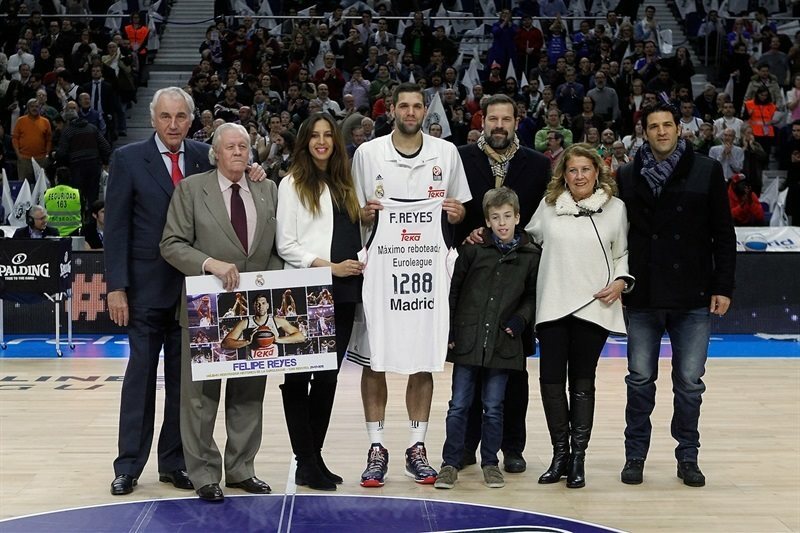 Felipe Reyes added 14 points and Sergio Llull 11 for the winners. 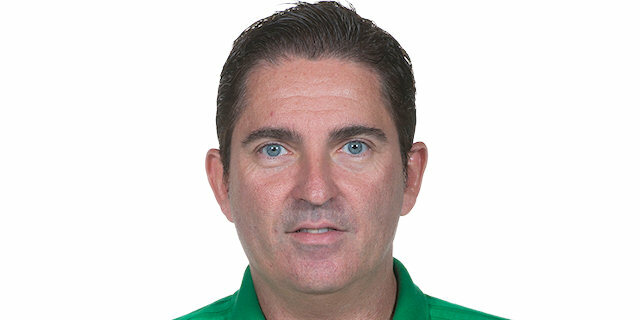 Barcelona, which missed 12 three-pointers in a row lasting most of the first and all of the second quarters, got 22 points from Mario Hezonja, who eventually buried 5 shots from long range. 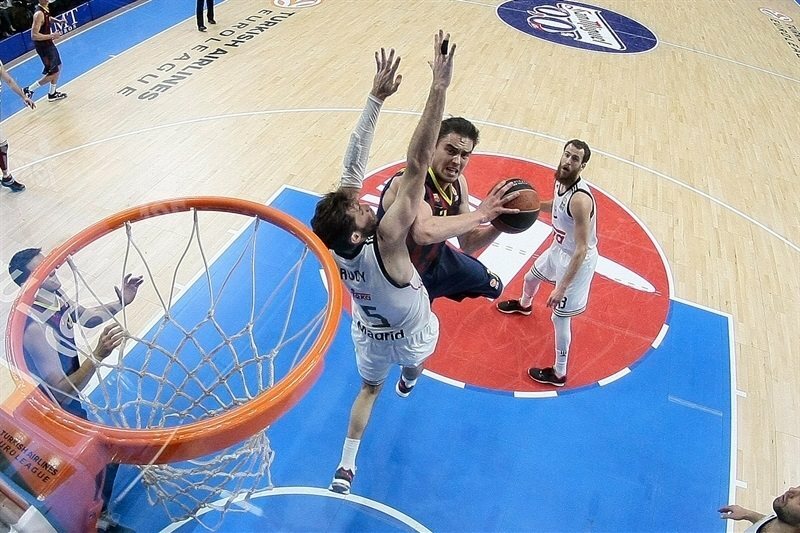 Ante Tomic added 12 points and Justin Doellman 11. Fernandez fed Gustavo Ayon for an easy basket and drilled a three-pointer to quickly put Madrid ahead 5-0. Doellman copied him at the other end and Tomic made both free throws for a just-as-quick 5-5 tie. When Doellman added a step-back baseline jumper, giving Barcelona the lead, Fernandez took it right back with his second triple. Ayon put back an offensive rebound and assisted Reyes in close to make it 12-7 as Barcelona racked up 6 consecutive misses. 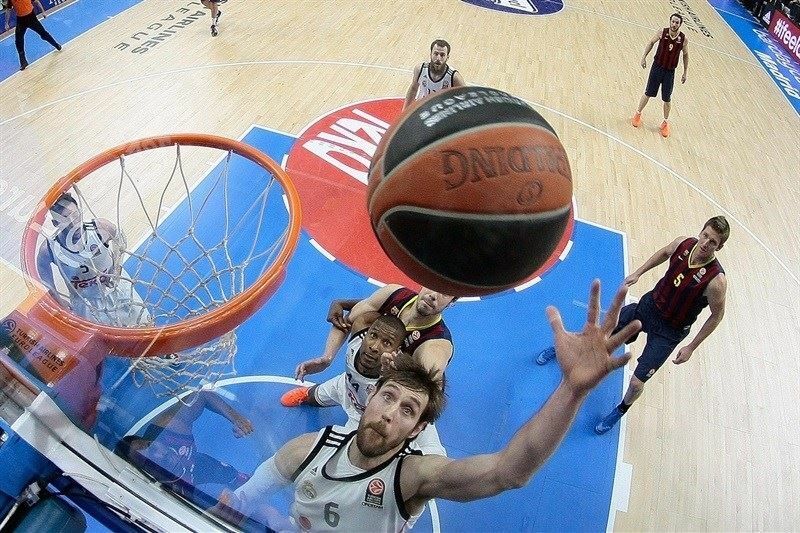 Fernandez made them pay with his third triple of the game for a 15-7 advantage that prompted a Barcelona timeout. 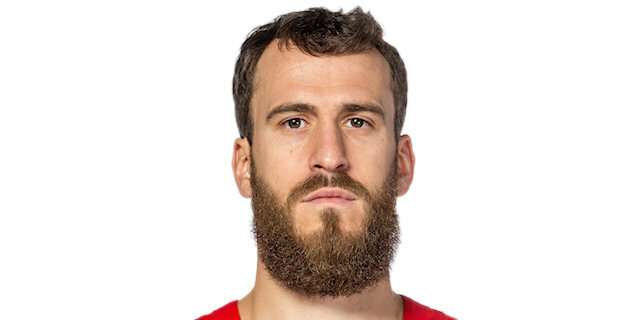 Marcelinho Huertas ended his team's drought with a basket-plus-free throw, but Fernandez was unstoppable, hitting a lane jumper then stealing to feed Reyes for a 19-10 lead. 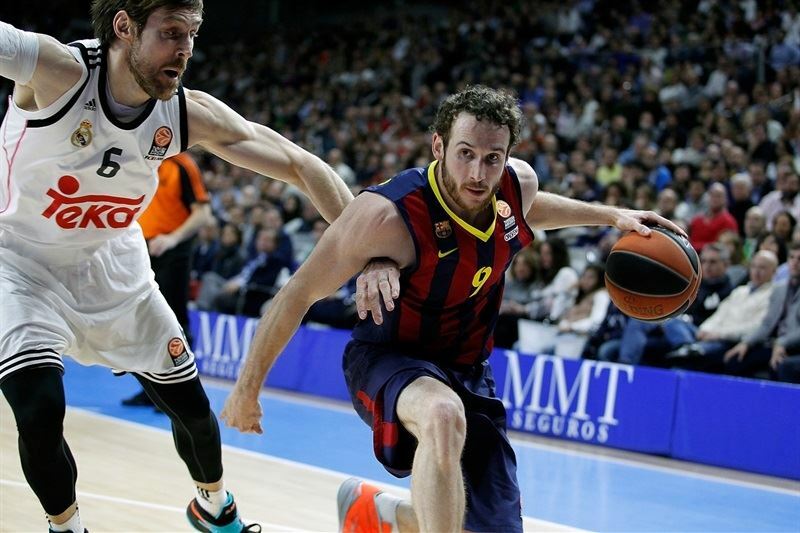 Huertas steadied Barcelona with a layup to which Tomic eventually added another. Rodriguez entered and answered with a stop-and-pop three-pointer at 22-14. 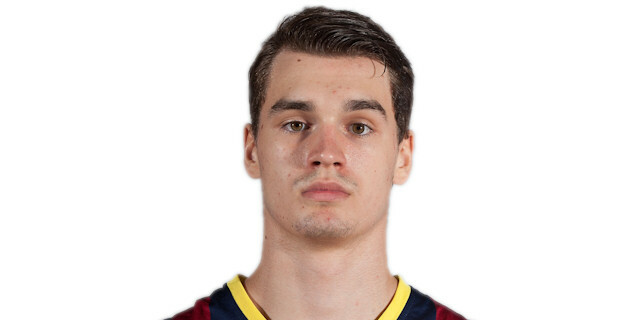 Tomas Satoransky's free throws for Barcelona were matched by those of Jonas Maciulis for Madrid. Marcus Slaughter saved a pair of offensive rebounds that allowed Rodriguez to feed a no-look pass to Maciulis for an open layup and a 26-16 Madrid lead after 10 minutes. Tomic struck first in the second quarter with a turnaround bank shot. Rodriguez restarted Madrid's scoreboard with a floating one-hander and 2 free throws for a new high lead, 30-18. A Madrid turnover sent Edwin Jackson ahead to dunk for Barcelona and then Tomic got to the foul line to cut the difference back to 30-22. Another floater by Rodriguez restored Madrid's double-digit advantage and Reyes added a free throw. Hezonja buried a long two-pointer before Tomic and Doellman hit 2 free throws each to lower the difference to 34-28. The free throw parade continued until Llull made an acrobatic layup and Doellman and turnaround jumper. Then Lull found Rodriguez for a long two-pointer that Barcelona matched with Satoransky feeding Hezonja for a second-chance basket. Reyes finished the half at the foul line, making both tries for a 42-33 Madrid lead. Reyes restored Madrid's double-digit lead by putting back an offensive rebound right after the break. Maciej Lampe got those points back and an extra free throw by converting a great pass from Tomic. Llull and Lampe exchanged baskets before Fernandez hit a step-back jumper at 48-38. That's when Hezonja broke Barcelona's streak of 13 missed three-pointers in a row. Fernandez downed another shot in the lane then fed Ayon for a layup at 52-41. 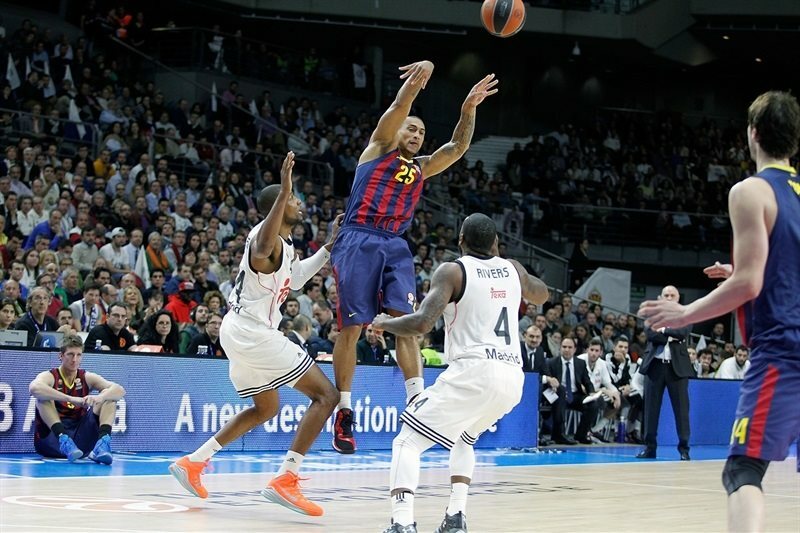 Barcelona's three-pointers started to fall now, with Jackson and Huertas making theirs back-to-back, between which Ayon fed Jaycee Carroll for a Madrid layup. Fernandez then came out of nowhere to dunk a miss, and when Ayon downed 2 free throws, Madrid's lead was back to double-digits 58-48. Barcelona needed a response and got it from Hezonja, with another three-pointer. Ayon's steal led to Andres Nocioni's first basket, a runner, and then the same two players combined again on a huge block and breakaway to take a 62-51 advantage. Madrid got its biggest lead until then, 64-51, on a huge hustle play that Ayon finished, but Hezonja answered with a reverse layup. 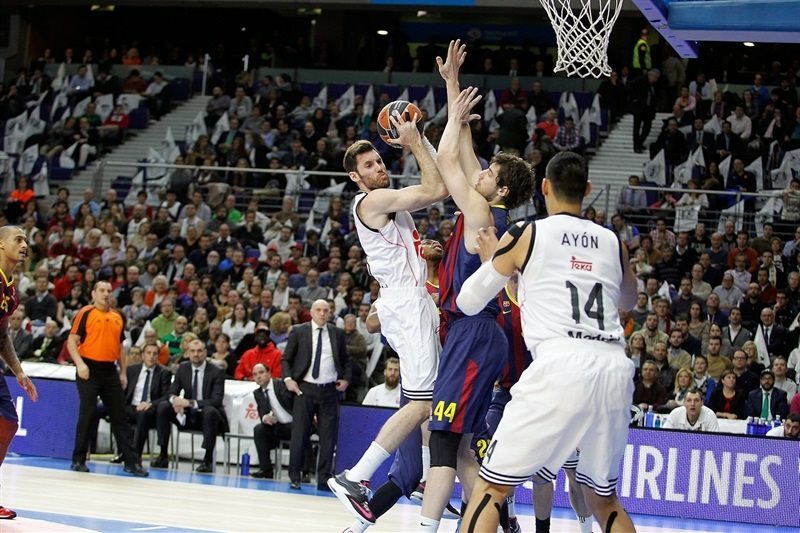 Llull's free throws finished the third quarter with Madrid still in charge, 66-53. Rodriguez dropped a runner, Fernandez drilled a jumper and Slaughter finished a layup as Madrid rolled up the score quickly in the final quarter. When Rodriguez hit a baseline jumper, suddenly the hosts had a 20-point advantage, 74-54. After a Barcelona timeout, Doellman scored inside and Hezonja hit a couple more threes, but Madrid was content to trade points as Maciulis scored on a hook shot, Llull from downtown and Rodriguez at the foul line. Hezonja would not be denied, as he hit his fourth three-pointer of the second half, but Rodriguez answered with a lane jumper at 83-65. Rodriguez then whipped a cross-court pass to Nocioni for another three-pointer and finished a broken play with a nifty layup as Madrid could do no wrong. Llull's basket made it 90-66. With an eye on the long-term possibility of tiebreakers, Madrid made sure down the stretch to claim the second-largest victory margin between the two teams in their 21 Euroleague games played over the last 21 years. "I think we worked really well in this game from the very beginning. We managed to correct the mistakes that we were making, especially on defense. It was a teamwork; we managed to stay focused all 40 minutes and get an important win." "Congratulations to Madrid for its win in a game in which they were clearly the better team in most aspects. Both teams had a good start, but Madrid was more inspired than us. We found good shots and good options that we were looking for. That lasted for five or six minutes, but after that, we started to pick up turnovers, one of the things we wanted to avoid in this game. 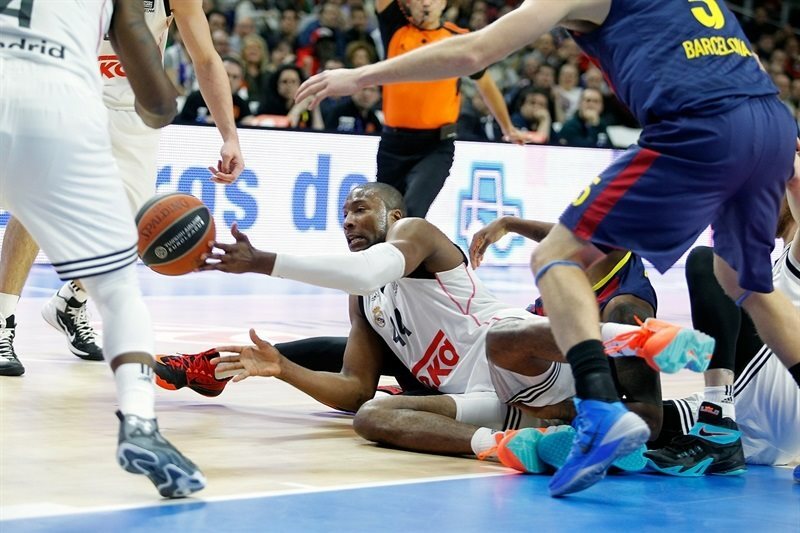 With 18 turnovers and 4 blocks against us, it is impossible to beat Madrid. We controlled the defensive boards in the first half and that kept us in the game. We had several options down 6 late in the first half and also in the third quarter, but in those important moment, we didn't have the right temperament. We were down by 13 at the end of the third quarter with the feeling that it was tough to come back and unlike in the rest of the game, we didn't compete well in the fourth quarter." "We had a great game, scoring 97 points. We played very good defense and when we play with this intensity and our fans behind us, everything is much easier. Above all, we have to keep playing with intensity. This is what we have been doing on defense and it is working well for us, but we have to keep working to do that even better." "This win gives us confidence and we have to keep working in this direction. We enjoyed playing today and I think our fans had a great time. It is great to see our home court sold out and to offer them a win against such a big opponent as Barcelona. It is very important to play good defense. We were really aggressive from the very beginning. We know they are a very talented team on offense, so we had to be aggressive and intense. That allowed us to be fluid on offense and find good shots. Each Clasico is a great game, a game to enjoy and it is true that we won by a big margin, but we have a long way to go and we have a tough game in Kaunas next week." "You cannot play like that against Real Madrid. They are a top-level team and we were out of the game when it mattered. We are a team and need all of us to give 100% in order to do something important in this club. We have to get back to practice tomorrow, play a Spanish League game against Tenerife and then face Galatasaray. This is the Top 16, a very important part of the season. It all will be over in three months and it is now or never. We have to raise our level and win games." 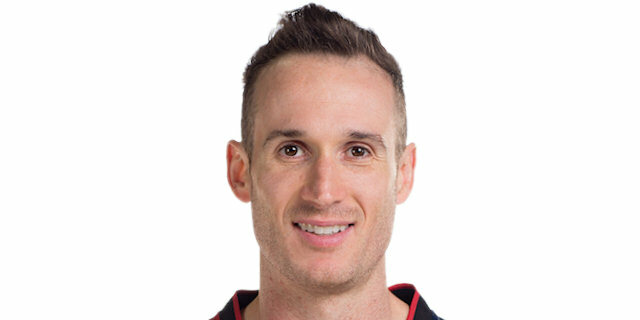 "We had our chances when we trimmed the deficit in the beginning of the third quarter. We returned to the game, but it is always dangerous to commit turnovers and give up offensive rebounds against a team like Madrid. We know they feel really comfortable when they play like that, and they got a lead that was tough to recover from. They can have one or two strong minutes and get big runs like they did today. Another road loss; we have to get better and start winning games, it is very important if we want to fight for first and second place in this group and get the home court advantage in the playoffs. Point difference is important and was too big tonight. We have to stand up and think about next week's game."